The Screaming Eagles, an 18U softball team based out of the Northeast Kingdom, have shown its selflessness on and off the field. The girls have received recognition for wearing the names of fallen soldiers on the backs of their jerseys. 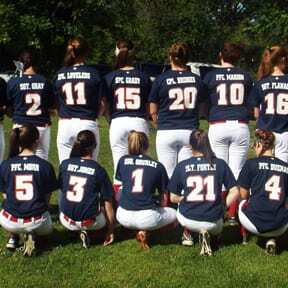 The Screaming Eagles is an 18U Junior Olympic softball team based out of the Northeast Kingdom. But it’s not the fact they are taking on college athletes in tournaments that sets them apart. It’s what the players chose to put on the back of their jerseys that makes them special. Instead of having their names on the back of the jerseys, each player has the name of a fallen soldier from Vermont or someone with whom coach Chris Haggett served. Haggett, who grew up in East Montpelier, served 15 years active duty in the Army and National Guard before he was medically retired in May. Haggett originally asked the players if they wanted to put Medal of Honor recipients on the back of their jerseys, but as the conversation progressed, the girls decided they wanted to honor fallen soldiers from Vermont as well as places Haggett served active duty. Haggett said the players even try to research information about the soldiers on their jerseys to find out more about them. “It means a lot to me as a retired combat vet and as a coach to think these girls are so young that would be willing to do something like that,” he said. The team is currently trying to raise money for a tournament in East Hartford, Connecticut around Halloween. Lydonville VFW Post 10038 donated money to help pay for the entry fee.